Description: Male has white sides, gray back, black breast and tail, and head has iridescent green sheen in the right light. In flight, has a long white wing stripe. 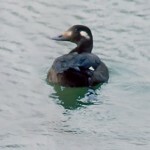 Female is brown with a white patch around the base of the bill. 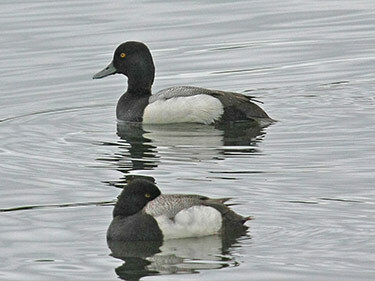 Habitat: Most Greater Scaup winter on the coasts. Migrants use large lakes and reservoirs. 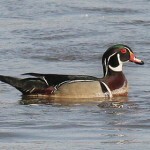 Where in Nebraska: Uncommon regular spring migrant and a rare regular fall migrant statewide. An uncommon,locally fairly common, regular winter visitor statewide. 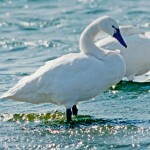 As many as 32 birds have been seen at the spillway of Lake McConaughy and the open water areas of Lake Ogallala. Careful observation of rafts of divers may result in a great look at the Greater Scaup. Field Notes: Morphologically very similar to the Lesser Scaup. Fun Facts: Greater Scaup females will thickly line their nests with down feathers, plucked from their own breast.